Get out of town with these interesting Geysir side-trips: The Cave People (in Laugarvatn) and Haafell Goats and Roses (in Reykholt). 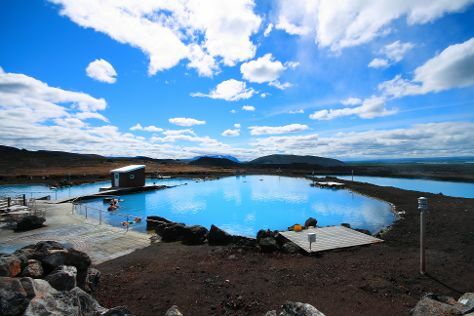 Spend the 2nd (Wed) exploring the striking scenery along Golden Circle Route. There's lots more to do: take in the dramatic scenery at Gullfoss, admire nature's wide array of creatures at Slakki Petting Zoo, witness a stunning natural landmark at Haukadalur, and tee off at Geysir Golf Course. For other places to visit, ratings, maps, and more tourist information, read our Geysir attractions planning website . Portland, USA to Geysir is an approximately 14-hour combination of flight and bus. You can also do a combination of train, bus, and flight. The time zone difference moving from Pacific Standard Time (PST) to Greenwich Mean Time (GMT) is 8 hours. Expect a bit cooler temperatures when traveling from Portland in January; daily highs in Geysir reach 37°F and lows reach 29°F. Finish your sightseeing early on the 6th (Sun) so you can drive to Hvolsvollur. Hvolsvöllur is a small town in the south of Iceland about 106 km to the east of Reykjavík.It is situated in the inland swamps of Landeyjar, in the municipality of Rangárþing eystra and has, as of January 2015, 934 inhabitants.OverviewThe name of the town literally translates to "Hillfield". Explore the numerous day-trip ideas around Hvolsvollur: Vestmannaeyjar (Saeheimar Aquarium, Eldheimar, & more) and Selfoss (Kerið, Gallery Floi, & more). Next up on the itinerary: take in the dramatic scenery at Seljalandsfoss, get a new perspective on nature at Lava Centre, stop by Sveitabuoin Una, and contemplate the long history of Keldur. To see photos, more things to do, other places to visit, and other tourist information, go to the Hvolsvollur vacation builder website . You can drive from Geysir to Hvolsvollur in 1.5 hours. Another option is to take a bus. Traveling from Geysir in January, expect somewhat warmer with lows of 35°F in Hvolsvollur. Finish your sightseeing early on the 12th (Sat) to allow enough time to drive to Vik. Change things up with these side-trips from Vik: Skogar (Seljavallalaug, Rutshellir Cave, & more). And it doesn't end there: enjoy the sand and surf at Black Sand Beach, stroll through Reynisfjara Beach, pause for some photo ops at Voyages Friendship Statue, and take in the dramatic natural features at Dyrholaey. For maps, reviews, traveler tips, and more tourist information, read our Vik road trip tool . You can drive from Hvolsvollur to Vik in 1.5 hours. Alternatively, you can take a bus. In January, daytime highs in Vik are 39°F, while nighttime lows are 35°F. On the 19th (Sat), wrap the sightseeing up by early afternoon so you can drive to Kirkjubaejarklaustur. Get out of town with these interesting Kirkjubaejarklaustur side-trips: Landmannalaugar (Ljótipollur, Laugavegur, & more). To see photos, ratings, more things to do, and other tourist information, use the Kirkjubaejarklaustur day trip website . Traveling by car from Vik to Kirkjubaejarklaustur takes 1.5 hours. Alternatively, you can take a bus. On the 25th (Fri), you're off toHof. Explore Hof's surroundings by going to Hofn (Huldusteinn & Hofn Swimming Pool) and Jokulsarlon Lagoon (in Jokulsarlon). 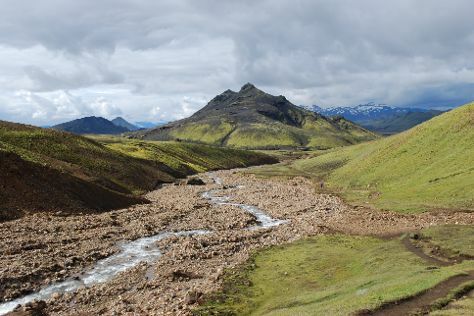 Spend the 27th (Sun) exploring nature at Skaftafell National Park. To find more things to do, traveler tips, and other tourist information, read our Hof trip planner . Traveling by car from Kirkjubaejarklaustur to Hof takes 1.5 hours. In January, plan for daily highs up to 38°F, and evening lows to 32°F. Wrap up your sightseeing on the 31st (Thu) to allow time to travel to Reykjahlid. Explore Reykjahlid's surroundings by going to Husavik (The Exploration Museum, Dolphin & Whale Watching, & more). There's much more to do: witness a stunning natural landmark at Myvatn Nature Baths (Jardbodin vid Myvatn), take in the dramatic scenery at Hverfjall, look for all kinds of wild species at Krafla Lava Fields, and head outdoors with Aldeyjarfoss. To see other places to visit, traveler tips, and tourist information, go to the Reykjahlid trip planner . Getting from Hof to Reykjahlid by car takes about 6 hours. Traveling from Hof in January, you can expect nighttime temperatures to be a bit cooler in Reykjahlid, with lows of 24°F. Finish your sightseeing early on the 6th (Wed) so you can drive to Akureyri. Venture out of the city with trips to Varmahlid (Víðimýrarkirkja & Glaumbaer Museum). On the 8th (Fri), ski the day away in the pristine settings at Hlíðarfjall. And it doesn't end there: hit the best photo ops around with an inspiring photography tour, look for gifts at Christmas Garden, contemplate the long history of Laxdal House (Laxdalshus), and don't miss a visit to Vaolaheioi Utsynispallur. To see where to stay, traveler tips, and tourist information, go to the Akureyri online trip planner . You can drive from Reykjahlid to Akureyri in 1.5 hours. Another option is to take a bus. In February in Akureyri, expect temperatures between 37°F during the day and 26°F at night. Cap off your sightseeing on the 12th (Tue) early enough to travel to Isafjordur. Venture out of the city with trips to Skruour Botanical gardens (in Thingeyri), Hnjotur - Minjasafn Egils Olafssonar (in Orlygshofn) and Dynjandi (Fjallfoss) (in Hrafnseyri). To see reviews, more things to do, and more tourist information, you can read our Isafjordur trip itinerary maker website . You can fly from Akureyri to Isafjordur in 5.5 hours. Other options are to drive; or do a combination of bus and car. In February, daytime highs in Isafjordur are 34°F, while nighttime lows are 30°F. Cap off your sightseeing on the 18th (Mon) early enough to travel to Reykjavik. You'll find plenty of places to visit near Reykjavik: Gunnuhver Hot Springs (in Grindavik) and Thingvellir National Park (in Thingvellir). On the 25th (Mon), give your taste buds a day to remember with a local gastronomic tour. There's much more to do: take in the architecture and atmosphere at Hallgrimskirkja, pause for some photo ops at Sun Voyager, get up close to creatures of the deep with a dolphin and whale watching tour, and relax and rejuvenate at some of the top local wellness centers. To find maps, where to stay, other places to visit, and tourist information, use the Reykjavik trip planner . Getting from Isafjordur to Reykjavik by flight takes about 2 hours. Other options: do a combination of car and flight; or drive. In February in Reykjavik, expect temperatures between 38°F during the day and 29°F at night. Finish up your sightseeing early on the 1st (Fri) so you can travel back home.